BridgeTower West is a new home community in Northwest Meridian, Idaho. The neighborhood offers a unique combination of the latest home designs, planned convenience and community connectivity while retaining an "old world" charm. You won't see any grand entrances but what you will find is a well-planned community, brick-lined streets and a vast array of amenities and convenience in, or nearby, the subdivision. BridgeTower West homes for sale are at the center of new growth surrounded by schools, retail, services, parks and recreational activities. LIVE, SHOP, PLAY… BridgeTower West. Browse all new homes in Meridian Idaho. If you are looking for a similar community, BainBridge Meridian is a good choice. 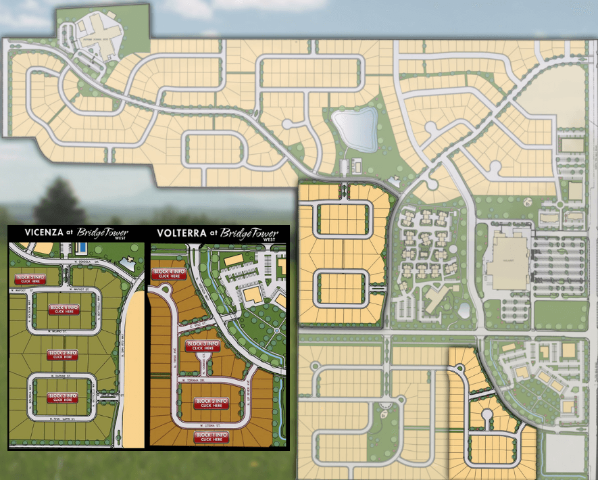 Homesites: Phase 1 & 2 (aka Vicenza & Volterra) from 0.15 acres (6,530 Sq. Ft.) to 0.465 acres (20,255 Sq. Ft.). BridgeTower West is located in Meridian, West of the N Ten Mile Rd and W McMillan Rd intersection. Questions about new homes for sale in BridgeTower West Meridian, ID? Contact us online or call (208) 391-4466.